Protests have ignited in Italy preventing the construction of Europe’s own Keystone XL - a BP-led gas pipeline designed to lock Europe into fossil fuel use for decades. For days, the Italian media has run front-page stories showing thousands protesting. On the pipeline route in Melendugno, hundreds of local residents block vehicles. Armed police enforce the excavation of ancient olive trees packaged in ghostly, white body bags, injuring protesters, including an elderly woman. And yet, this is only one, miniscule part of what it takes to ensure our future fossil fuel use. 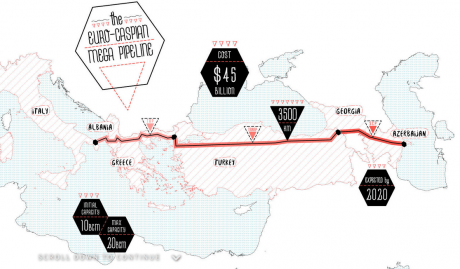 The proposed 3,500km BP-led Euro-Caspian Mega (ECMP) pipeline would stretch from Azerbaijan to Italy and is opposed nearly everywhere. In Azerbaijan, Ilham Aliyev’s corrupt and repressive regime has ruled for 23 years propped up by oil and gas revenues. Journalists, writers, lawyers, and activists who dared to question Aliyev’s authority are jailed. The situation is now so dire that Azerbaijan has been suspended from the industry’s own initiative set up to promote transparency and good governance. In Turkey, the pipeline crosses Kurdish regions that are currently affected by an escalation of violence following the breakdown of peace talks in July 2015. In Albania and Greece, farmers whose land is being appropriated have not been adequately consulted or compensated. At the same time, the project has been mired by corruption scandals, currently going through the legal system in Italy. You can watch Platform’s web documentary about the pipeline here. Despite this, the pipeline is already attracting extraordinary support. BP has already sunk $10 billion into the initial development of the Shah Deniz Field where the gas will, at first, be sourced. It has received hundreds of millions of dollars in loans from the World Bank and the Asian Development Bank. The EU has named the pipeline one of its “projects of common interest’ even though its State of the Union report warns against supporting infrastructure that could lead to “stranded assets’ or “carbon lock-in.” Despite fierce local opposition, governments along the route supported it, sometimes without conditions that would seem to be in their direct economic interest. All along the pipeline route, whether it is autocratic regimes such as Azerbaijan or liberal democracies such as Italy, all interests seem subordinated to those of the fossil fuel industry, creating a zone outside of legal and political norms. The ECMP is of great strategic importance to the fossil fuel industry, particularly BP. The UK and the EU are phasing out coal. But the fossil fuel industry wants to stay in control using the myth that gas is a clean, transition fuel. In truth, gas may not be much better for the climate than other fossil fuels as its methane emissions have been vastly underestimated. However, the industry is using this myth to gain support for new gas pipelines, fracking and UK power stations. Its goal is to ensure this very fossil fuel ‘lock-in’ that European countries have committed to avoid, where profits are secured and preventing the pivot to a truly clean energy system. This week, whilst communities in Italy blocked bulldozers to stop ECMP, activists in the UK took daily action against the fracking industry as part of #breakthechain - 2 weeks of protest called by Reclaim the Power. "This is the biggest challenge we have at the moment as a company ... The fact that societal acceptance of the energy system as we have it is just disappearing." People power has successfully challenged the might of the fossil fuel industry but it’s not over yet. Gas is fast becoming the new front-line in the battle over Europe’s energy future.